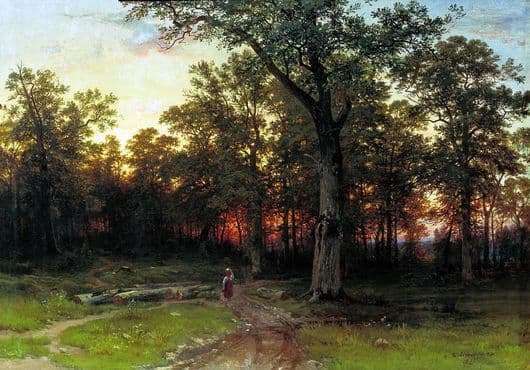 The great Russian artist Ivan Ivanovich Shishkin painted a large number of unique paintings, among which is the painting “The Forest in the Evening”, written in 1869. The work is one of the best in the work of the artist and rightfully enjoys great attention from the public. In this picture Shishkin showed the beauty of nature and the forest in all their glory. The plot is simple, but incredibly interesting. You can watch the picture for hours and find new and interesting explanations, everything that happens there. The work is written in oil on canvas. To paint a picture, the artist used warm shades that allowed him to make the landscape warm, kind and simple. Everything is perfect here: a little girl standing on a winding forest path, lush green grass growing on the edge, huge trees that have stood for centuries and, of course, sunset. In the distance, there is a blue horizon that shows where the forest ends. In the foreground is a huge tree, which has a rich history dating back more than a dozen centuries. Despite late time, nature breathes and lives its own life. The girl stands in a sarafan and thin shirt, it gives a feeling of warmth and unity with nature. She is not afraid of anything, neither forest sounds, nor the chirping of birds, nor the night rustles. Before us is the complete harmony of man and nature. The Russian soul feels calm and serene, I want to go there in this quiet and comfortable world, where there are no problems and fuss. A wonderful game of colors gives us the beauty of nature in its original form, where there is no falsehood and evil. Looking at the picture you want to forget and breathe deeply with clean and fresh forest air, as well as indulge in dreams and memories. The artist makes the viewer think and experience new, warm and kind feelings. He painted the picture with love and kindness to nature, in the hope that it will be given to us to people.